“We also have no reason to believe there’s any nexus at all to terrorism at this point,” said FBI Special Agent in Charge Gordon Johnson. The SUV driver, an NSA police officer and an onlooker were all hospitalized. WASHINGTON — Wednesday morning’s shooting incident at the National Security Agency’s headquarters in Fort Meade, Maryland, injured three people but is believed to be an isolated incident, an FBI official said during an afternoon news conference. “We also have no reason to believe there’s any nexus at all to terrorism at this point,” said FBI Special Agent in Charge Gordon Johnson. The incident began when an SUV hit a security barrier near the facility. An NSA police officer and a civilian onlooker are both being hospitalized with non-life-threatening injuries. The SUV’s driver, who was also hurt, is being hospitalized as well. “At this point in time we do not believe any of the injuries sustained were from gunfire,” Johnson said. Two passengers in the SUV were taken into custody and are being interviewed, said Johnson, who emphasized that the investigation is ongoing. “We’re still in the fact-collecting business right now,” he said. Earlier Wednesday, law enforcement sources told WTOP that the people in the car were not “targeting” the NSA or Fort Meade. It’s not clear whether they were running from local police, but they somehow ended up at the gate, and crashed through it, and then tried to exit the gate. The FBI is leading the investigation into the incident. NSA Police and local law enforcement are addressing an incident that took place this morning at one of NSA’s secure vehicle entry gates. The situation is under control and there is no ongoing security or safety threat. Video from the scene showed an SUV with at least two bullet holes in the front windshield. A man could be seen handcuffed, sitting on the ground near the vehicle. Blood-stained materials could also be seen on the ground near the SUV. After the incident, authorities closed Maryland Route 32 in both directions, causing major backups throughout the area during rush hour. The ramp to the NSA visitors’ entrance is closed. The investigation could lead authorities to close the road once again. President Donald Trump was “briefed on the shooting at Ft. Meade,” and the White House offered thoughts and prayers with those who have been affected, spokeswoman Lindsay Walters said. But in early 2015, two people were shot at by NSA police when they disobeyed orders outside the heavily secured campus. 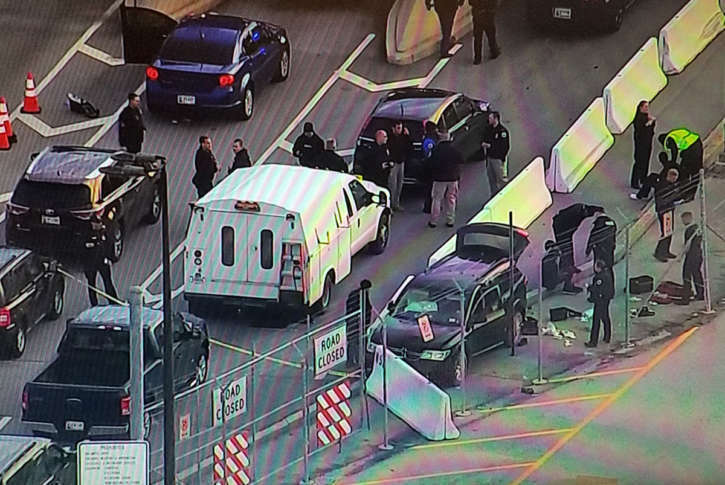 One driver died at the scene after NSA police opened fire on a stolen SUV. Authorities later said they had stolen a car from a man who picked them up for a party at a motel.